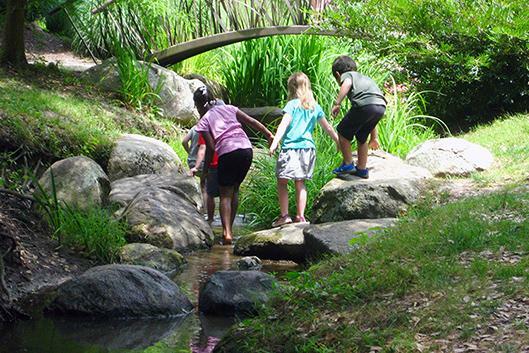 Join other homeschool students at Duke Gardens in a small group setting with classes designed to maximize exploration in nature. Learn methods scientists use to safely catch and study living things in different habitats. We'll use a range of techniques in each class, depending on the area we're investigating and the animals we're expecting to find, and we'll submit our findings to a citizen science database. This section focuses on life underwater. Consider water quality as you discover the many waterways of Duke Gardens and compare their living communities. Dip for tadpoles, minnows and macroinvertebrates. Keep a sharp eye out for basking turtles and listen for calling frogs. Additional Naturalist Class sections: Feb. 26, March 19 and May 14. Please also see the Naturalist Class opportunities for ages 7-9. Location: Meet at the Doris Duke Center. Fee: Gardens members $7 per class; general public $10 per class. Register for all 4 classes at a fee of $6/$9 each. Please ask about our younger sibling policy. Parking: Parking pass included with advance registration. Information/registration: 919-668-1707 or gardenseducation@duke.edu.